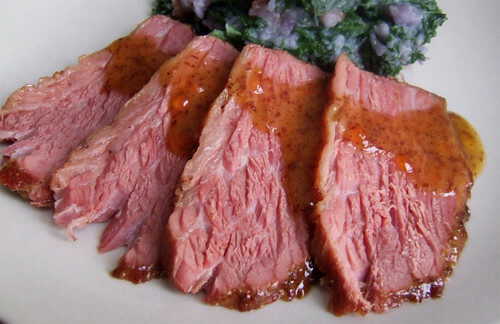 While looking around for recipes and inspiration, I saw that some braised their corned beef in Guinness. Of late though, I've had a crush on Mill Street's Coffee Porter. It's such a unique beer with a rich chocolatey-caramel flavour to it, and it is so much fun to cook and bake with. And so in went the coffee porter as well. The corned beef was braised slowly in the oven for about two and half hours, filling the apartment with an intoxicating smell of meat, beer and spices. 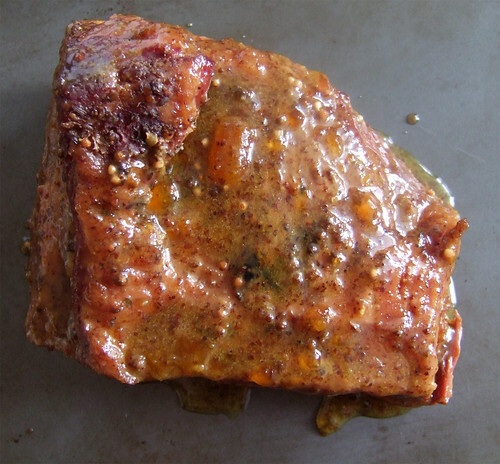 The beef was finished off with an apricot-mustard glaze, which adds a lovely sweetness and slight heat to the meat. 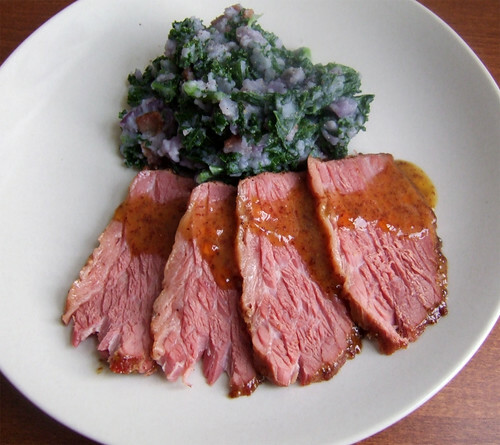 I served the beef with some of the extra glaze and with colcannon, a traditional Irish dish that's usually made with mashed potatoes and cabbage or kale. I used purple potatoes and kale, making for a really colourful presentation on the plate. What's great is that you'll have plenty of leftovers (depending on how big a piece of beef you buy for the number of people you're serving). It makes an amazing sandwich (corned beef grilled cheese or a corned beef reuben) or the perfect brunch the next morning with some corned beef hash (try it with some sweet potatoes). Place the corned beef, along with the spices, in a large Dutch oven. Pour the beer over the beef, then stir in the brown sugar and mustard. Cover tightly with the lid and place in the center of the oven. Braise for two hours, taking it out every half an hour to baste with the liquid. If the beef is not fork tender after two hours, increase the oven temperature to 350 F and braise for another half an hour. Remove from oven and allow to rest in the pot for at least 20 minutes. Increase the oven temperature to 350˚F. Stir together the jam and mustards in a small saucepan over low heat until just heated through. Remove the corned beef from the liquid, allowing most of the liquid to drip off the meat, and place on a baking sheet or in a shallow roasting pan. Brush half of the glaze all over the surface of the beef. 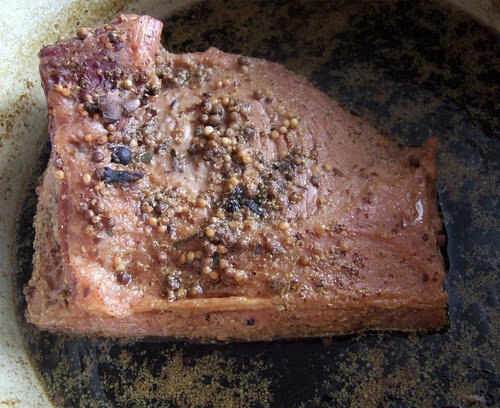 Place the beef in the oven and roast until the glaze starts bubbling, about 10 minutes. Remove and allow to rest for 10 minutes. Slice and serve with the warmed leftover glaze and your choice of greens. Sarah March 14, 2011 at 6:21 p.m. Pick me up off the FLOOR that looks amazing! !